[THOMAS JEFFERSON]. Book. 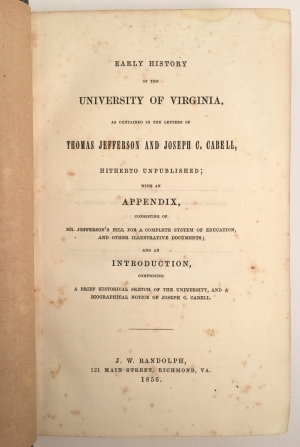 Nathaniel Cabell, Early History of the University of Virginia, As Contained in the Letters of Thomas Jefferson and Joseph C. Cabell..., Richmond, J. W. Randolph, 1856, 528 pp. 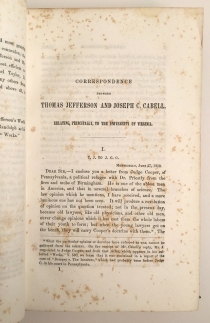 This early history of the institution was assembled from letters between Jefferson and Joseph Cabell dating between June 27, 1810 and April 21, 1826. Joseph Cabell (1778-1856) served in the Virginia General Assembly and was involved in planning the university from its beginning. He was the university’s strongest advocate in the state legislature and joined the university’s first Board of Visitors in 1819. He served as a board member longer than any other founder—until his death in 1856. The work includes a biography of Cabell, a historical sketch of the university, and appendices describing Jefferson’s plan for the university. 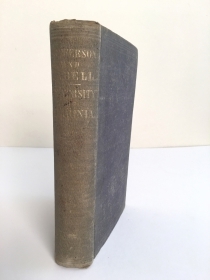 Grey cloth with blind stamp to front and back; gilt lettering to spine; endpapers advertising books also published by Randolph. 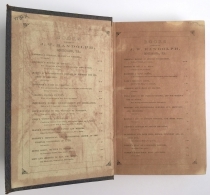 Rubbed, fading and loss to gilt to spine; endpapers discolored, lightly foxed throughout.